As architectural styles come in and out of vogue according to the whims of the era, its understandable that we often see an abundance of homes that look pretty much the same, even in highly contrasting parts of the world. 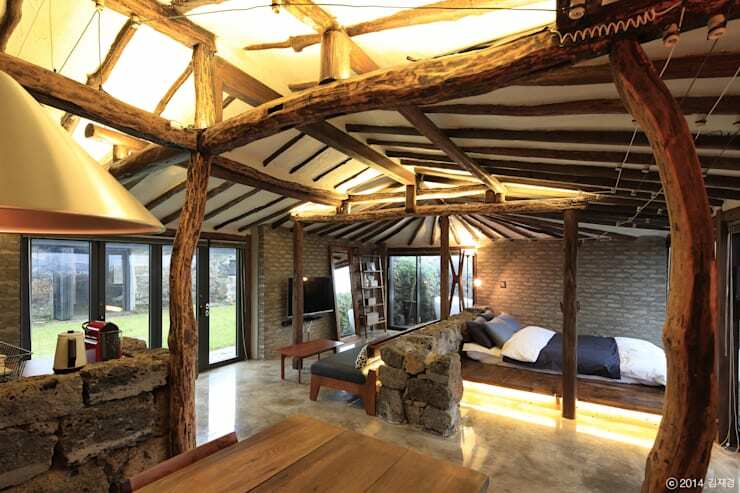 This next special dwelling seeks to buck that trend, with Korean architects, Z_Lab, having created a home designed to emulate and honour its natural surrounds. 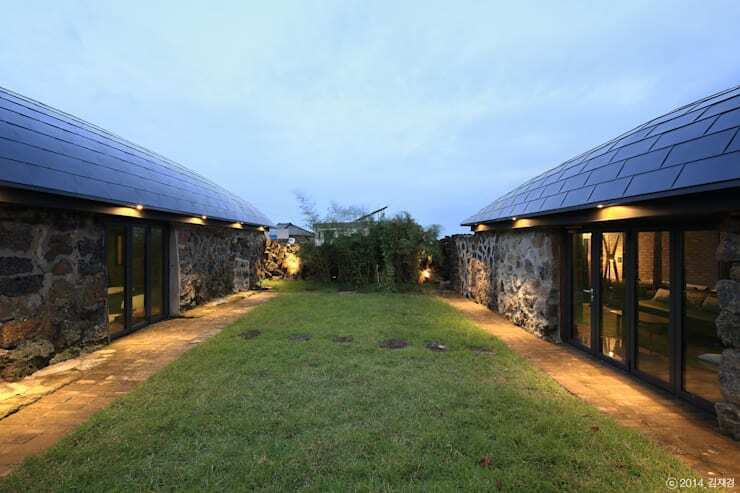 Located on Korea’s Jeju Island, the design of this dwelling was approached with a range of considerations in mind. 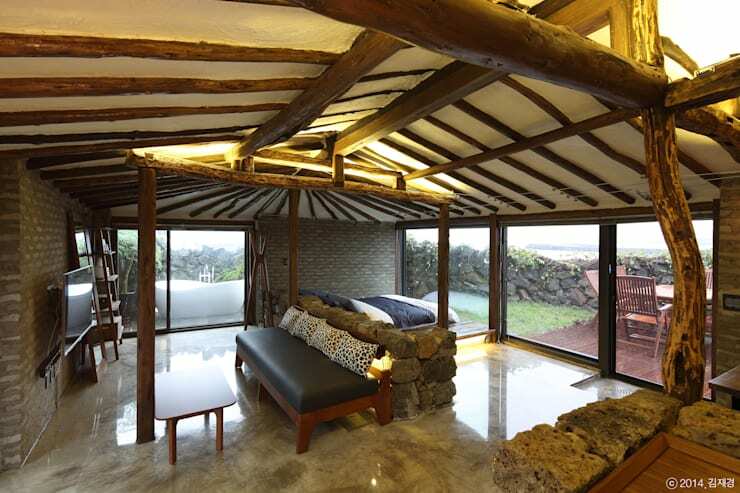 Strong winds often stream across the island for example, a fact that informed the home’s relatively flat construction and streamlined roof, while its stone walls and wooden skeleton were created using local timber and slabs of the island’s natural, volcanic rock. The result is a strong yet aerodynamic structure, that draws on the raw materials and conditions of its natural environment to produce a highly unique home both inside and out. Since its construction, this abode has become one of the architectural drawcards of the island, with many admiring the way its unique form complements the natural landscape. Take a tour below and tell us what you think it adds to the neighbourhood! 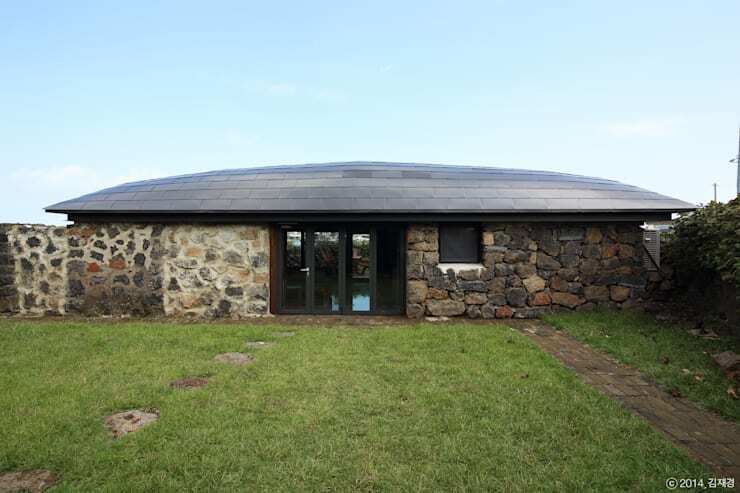 From this outside this home immediately presents a unique and intriguing form, with the sleek curve of its black, tiled roof resting in strong contrast to the rough stone of its exterior walls. 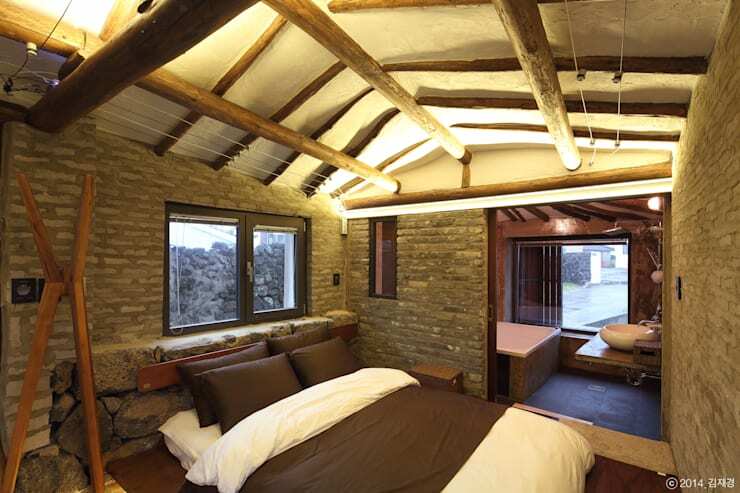 The stone facade evokes a sense of natural history, giving the impression that the home has been around for a very long time, while the modern construction of the roof confirms the presence of a contemporary dwelling. 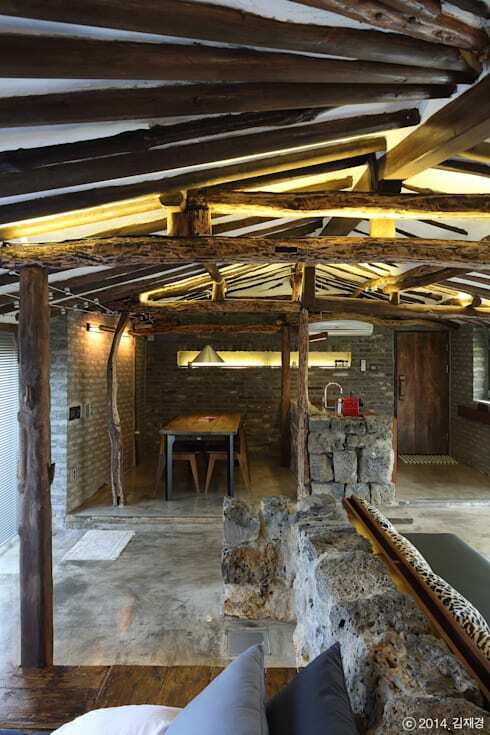 The interior of the house is absolutely extraordinary and combines a range of textures and design materials. The rough stones featured in the façade remain prevalent, constructing a range of shallow partitions, while grey bricks have been used to line the interior walls for a smoother, insulated finish. Polished concrete floors flow underfoot, while overhead a skeleton of magnificent, untreated timber beams support a lofty, rendered roof. This vantage lends more insight into the range of styles and materials used within this incredible abode. The small kitchen and dining space in the distance has been delineated by an alcove of grey, with small bricks and large stones creating walls and partitions. A modern dining setting with simple, wooden table and chairs adds a stylistic contrast, particularly relative to the rustic, wooden beams that flow overhead. A contemporary, silver hanging lamp completes the effect, alongside the sheen the silver fittings in the kitchen. Another change of perspective beautifully showcases the open plan of the dwelling, with living, dining, kitchen and bedroom spaces combined within the same cosy, unique space. A chic, leather-trimmed sofa sits simply in front of a mounted television, adding yet another modern edge to the home’s rustic atmosphere, while a comfortable bed takes prime position in front of the large doors. Outside we can see a beautifully constructed, timber deck presents a space for outdoor entertaining, while a contemporary bathtub also sits calmly on the lawn, inviting relaxation amidst the elements. The outdoor bath tub included in this house is truly a wonderful design feature. 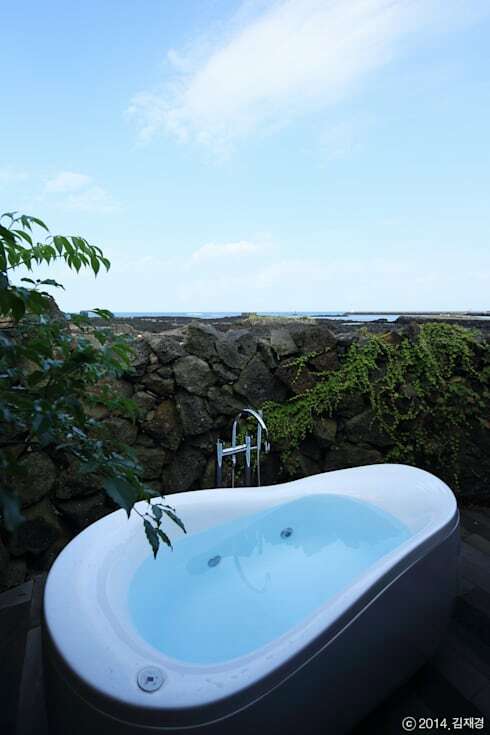 The contemporary, curved design of the tub presents a wonderful aesthetic contrast against its rocky surrounds, while its position atop an outdoor deck, shielded by a rocky wall, perfectly balances the picturesque and the private. Moving through the abode and we can see that this house comprises not one, but two separate constructions, conjoined by this simple, central garden. While the first construction presents an open plan, brimming with rustic style and intrigue, its counterpart takes a more traditional, private approach to its interior. The interior of the second construction is just as cosy and comfortable as its predecessor, but has been designed with more of an eye for privacy. Walls of the same grey brick seen previously separate the master bedroom and bathroom within the space, with the latter appearing luxurious and modern, replete with spacious spa! Soft lighting beneath the ceiling beams infuses the dwelling with a warm atmosphere, while a range of windows provide for the circulation of air and light during fine weather. Did you enjoy the unique design of this incredible dwelling? Then take a tour of these 5 Spectacular Homes of Colour and Creativity for more architectural inspiration! Do you like the idea of your home's design drawing from its natural surrounds? Tell us your thoughts below!